CAREER – BANK OF ENGLAND (Economist, 1969 to 1975), followed by a career in International Banking - Managing Director, 1975 to 2002 and Non-Executive Board Director, 2002 to 2014. Potters Bar U3A, 2002 to present. Committee Member 2004 to 2010. Group Leader – at various times, Scrabble, Golf, Long Walks and Member – Shakespeare Group. Barnet U3A, 2007 to present. Joint Founder and Co-Chair – 2007 to 2014. Regional Trustee (London) on the Trust's National Executive Committee (NEC) – 2014 to 2017. Member – Standing Committee on Education (2014 to 2015). Member – Finance Committee (2015 to 2017). Member – Governance Committee (2016 to 2017. Chairman – International Committee (2015 to 2017). Advice Sheet on Paid Tutors (2014). The International Third Age Movement (2015). The Non-Editorial Aspects of Third Age Matters (2016 & 2017). The Consultation Process into the Future Structure of the Third Age Trust (2017). The national U3A website has reports on the above subjects. During my time on the NEC, I have visited most of the U3As in the London Region and, as a member of the Working Group on the Future Structure of the Trust, I have visited the major Networks of U3As in the southern part of the UK. During these meetings I have met a cross-section of members and received grass roots views on achieving a mutually beneficial relationship between individual U3As and the Trust. My interests include the History of London (my wife, Pat, and I founded London Walks in the 1970's), vegetable gardening, reading, theatre, grandchildren......and, Manchester United! My business background has helped me make a contribution to the NEC, in particular in the areas of finance and governance. Talking to individual U3As and Networks, as well as Lectures and Walks on Historic London, has developed skills that will assist in speaking engagements promoting the U3A, both internally and externally. 15 years of involvement with the U3A movement, at both a local and national level, provides a base of experience that will assist in undertaking the VC role. a) to contribute to the continuation of NEC decisions reflecting the grass roots nature of the U3A movement. Officers and Trustees recognise that the Trust only provides advice and support to U3As and that each U3A is operationally independent, as long as it accepts the ethos of our Founding Fathers and does not breach Charity Commission guidelines. Against this background, the Trust provides valuable support to U3As through National Office advice on a very wide range of issues. The Trust's continued provision of consistent and professional advice, via the CEO and National Office, is an area to which I can contribute, based on past experience. b) to improve communication links between the membership and the Trust. Meetings with members during this year's Consultation Process on the Future Structure of the Trust, made me very aware of the fact that internal communication links can to be strengthened in a number of ways, including more contacts with Networks, Links, Clusters,etc. Externally, it is important that the Trust ensures that the media is more aware of the contribution that the U3A makes to communities, preventing isolation amongst Third Agers, and encouraging informal learning and social activities. c) to facilitate continued growth of one of the great success stories within our movement over the last few years - the organic development of Networks, etc. These informal groupings, large and small, of local U3As have been very successful in bringing members together to share experiences, run workshops, seminars, etc. They are a fine example of the “bottom up” nature of the movement and will benefit from support, where appropriate, from the Trust. d) to draw on my career experience of finance, governance and management to assist the Trust in ensuring that these key areas continue to be addressed in the interests of the wider membership. e) that informal learning is one of the key principles of the movement. Continued development of the use of on-line learning via, for example, MOOCs (Massive On-Line Open Courses), is an area where the Trust is making an important contribution. In addition, the links that already exist between some U3As and their local Universities, can be encouraged further by the relevant NEC committees. f) that the key strength of the movement is its “self-help” ethos provided by nearly 400,000 members. Within this membership lies a depth of skills and experience. This year, the Trust has undertaken an extensive publicity campaign to attract members to help set up new U3As, as well as presenting Workshops on starting U3As, managing Committees, trouble-shooting, etc. In addition, members with specialist skills are being invited to consider joining NEC sub-Committees. This process has already started and our aim should be to have non-Trustees on all the NEC sub-Comnmittees (Development, Education, Finance, Governance,IT, International and Research) so that they represent the views of the wider membership and the Trust benefits from their career based experiences gained in a variety of fields. 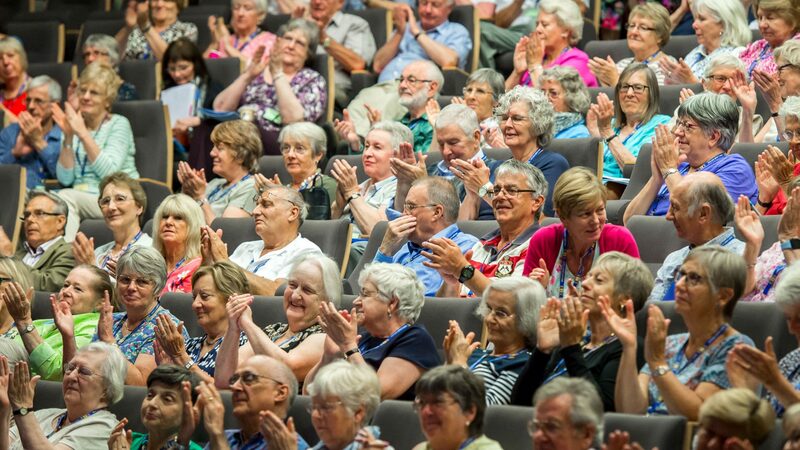 I hope that, by using my career background, as well as my specific U3A experiences, I will be able to make a contribution to the continued growth and good health of this truly unique organisation of which we should all be truly proud to be members. I believe that, based on the above information, I can contribute to the continued growth and good governance of the U3A movement in the UK and I will be honoured to serve the membership if elected as one of the two Vice Chairmen. Born in the UK, I spent 7 years in Australia where I gained an Honours degree in English Language at the University of Sydney. This was followed by a year’s teaching and a year with the National Library of Australia in Canberra before returning to the UK. After time spent as a Reference Librarian and an Educational Consultant, I moved into training which formed a large part of my subsequent career. Having discovered that I was not cut out to be a career Civil Servant, I moved into the Oil industry working initially as a Training Advisor with the Petroleum Industry Training Board before joining Shell as an Office Systems training manager, a newly emerging area of technology. For twenty years I worked largely in Information Technology as Training Development Manager and Consultant, helping staff to realise the potential of company systems and technology generally in their day to day activities. I was responsible for a number of projects in this area, including the implementation of tools to support the Brand on a new global desktop. My interest in IT has continued in my retirement where I have been able to put my skills to good use producing publicity material for the East Midlands Region and the Networks to support awareness campaigns and the launch of new U3As. Secretary from 2004 until 2009 when I helped to start Woodhall Spa U3A. During this time, I ran a number of Interest groups and managed some local projects. One of my most rewarding experiences was setting up a Local History and discussion group in a residential home in Woodhall Spa. Over 5 years, the level of participation by the residents increased significantly and their lives have been enriched by their involvment. 2003-2012 actively engaged in the East Lincolnshire Neighbourhood Group and the Lincolnshire County Network but stood down as Network Secretary in 2012 when I became the East Midlands Regional Trustee. Attending Network and Regional meetings gave me a real insight into the workings of the networks and their U3As. Working with the Network Development Teams has been particularly rewarding and together we have produced plans not just for the future of the U3As in the Region but also for the creation of new ones. Good Communication is core to our plans and to help improve our communications, I set up a series of Regional and Network folders on Dropbox so that the latest version of documents was readily available for access by the teams. My tastes are fairly catholic but my main interest has always been helping people. I find language and history attractive, I can speak reasonable French and German and have continued to study various periods of History, in particular the Plantagenets and the Victorians. A dog owner for many years, I needed no excuse to walk but now I walk as many times a week as I can, with fitness and vanity as my motivators. I enjoy mainly classical music, the theatre and cinema. Three grandchildren constantly challenge my knowledge but also bring me up to date with things they think I should know. I can still keep up with them on strenuous walks on the Isle of Wight where they have a holiday home but my latest Brownie points were gained Karting on the island last Christmas. My skills lie in communication, organisation and using technology to good effect, all essential to successful growth in the U3A movement. I have always enjoyed being at the sharp edge of technology but, a Windows user since 1982, I hesitated over making the move to a different environment. With the introduction of an NEC IT Committee, I realised that there were untold opportunities outside my comfort zone. So I am now extending my skills to cover iPad, Apple Mac Book and iPhone. I believe I can contribute to the U3A movement, by showing members how to take advantage of newer IT tools at a personal level (to whet their interest) and by introducing Committees to new ways of managing their membership data and finances and communicating with their memberships. My belief in the uniqueness of the U3A movement and my wish to play a positive role in its future development lie behind my wish to become one of the National Vice Chairmen. Since the AGM in 2014, I have been working with U3As in the East Midlands Region for them to become more involved in the communication process through their County Networks. They are already taking a more pro-active role and contributing to the development of the Region’s 102 U3As. This in its turn will bring more growth, both to existing U3As and the emergence of new ones. Communication will be to the forefront of my vision closely partnered by fostering team work across the organisation. My vision is to see our hugely successful U3A movement grow and prosper. I believe passionately in the Guiding Principles of the Movement – they are what make us unique. What other movement today is growing at 7 or 8% a year? Most are struggling to attract members. But I do understand that we need to take account of change and, after evaluating the impact, incorporate those things which will contribute to our growth and promote their take up. Change affects our entire membership, whether they like it or not, so we should be helping them, not simply to adjust to it, but to reap its benefits. I would also ensure that sufficient support is provided both for new U3As and those already in existence. Just as national standards are being developed to guarantee that new U3As are given appropriate training and the correct facts they need about the organisation, its ethos and its structure so we should be making sure that established U3As do not lose sight of the U3A ethos and the Guiding Principles. Learning must be encouraged and supported in many different ways to meet the diverse needs of our membership. Promoting self-help learning will enable us to fill the holes left by the loss of adult learning facilities. U3A is getting larger every year so our communication challenge will become greater. Members need to be made aware of all communications delivered by the NEC, their Region and their Networks and by U3As themselves. To support this, clear and effective communication must be one of the major tools in a Vice Chairman’s portfolio. One of my aims is to build trust with members across the organisation and to convince U3A committees that they do not have the right to filter out information which they have been asked to share with their members. There are still many areas where we are unknown. If we can get U3As to be more aware of the messages they should be sending out and encourage them to share their experiences with a wider audience, together we can raise the profile of the entire movement. I am prepared to play an active role in promoting the U3A movement, in helping its members to gain maximum benefit from being active in an increasingly diverse organisation whilst not losing sight of the very real benefits learning can bring in later life: Learn Laugh and Live could not be bettered as our strapword.